Subject: How does the Infiltration Maximum Time to Drain the Upper Soil Zone Work in SWMM 5 Green Ampt? How does the Infiltration Maximum Time to Drain the Upper Soil Zone Work in SWMM 5 Green Ampt?by dickinsonreSubject: How does the Infiltration Maximum Time to Drain the Upper Soil Zone Work in SWMM 5 Green Ampt? You can use the monthly soil recovery factor (Figure 1) in SWMM 5 to change how the Infiltration Maximum Time to Drain the Upper Soil Zone (Figure 2) is computed each month during a continuous simulation. And the Upper Zone Moisture Depletion Factor and Infiltration Maximum Time to Drain the Upper Soil Zone is calculated at each hydrology time step in SWMM 5. Subject: What are the Equations for Weirs in SWMM 5, Part 2? The treatment variables for Water Quality in a SWMM 5 storage unit (Figure 1) can be either: 1. A Process Variable a. HRT or Hydraulic Residence Time b. DT or Time Step c. FLOW or The Current Inflow d. DEPTH or the Mean Flow over the Time Step e. AREA or the Mean Area over the Time Step 2. Pollutant Concentration 3. Pollutant Removal based on the Removal of Other Pollutants With a Wide Range of Treatment Functions (Figure 2). What are the Equations for Weirs in SWMM 5? Subject: What are the Equations for Weirs in SWMM 5? 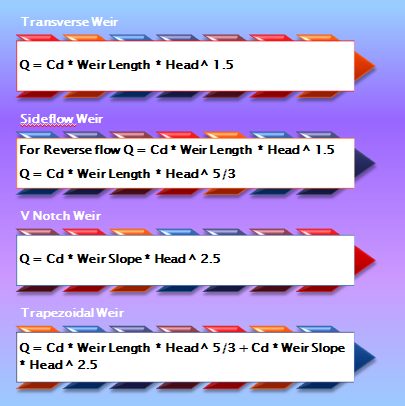 There are four types of Weirs in SWMM 5: Transverse, Sideflow, V Notch and Trapezoidal. The trapezoidal weir is a combination of the Sideflow and V Notch Weir and the Sideflow acts like a Transverse Weir when the flow is reversed (Figure 1). Toilets Save Lives Erika Christakis advocates for better sanitation. She points out that the "impact of poor sanitation — and its economic consequences — is well-known": Source, The Dish So why hasn’t this become an issue of global concern? Instead, between 1997 and 2008, the percentage of international aid that went to sanitation and water fell from 8% to 5%. Concerns over safe drinking water get much more attention, despite a recent World Bank study that found a more pronounced impact on health from building toilet infrastructure than from drinking-water improvements. Few people enjoy talking about bodily functions, and it’s hard for emerging economies to get excited about pit latrines and compost toilets when they’d rather showcase their shiny new buildings and high-speed trains. Feces and open sewers are a hard sell for donors too. There’s no pretty logo — no babbling brook or fresh water spring — for a toilet. Figure 1. The short, medium and long UH's are convoluted in SWMM 5 from the Rainfall Time Series. Figure 2. The Initial Abstraction Depth can be used to shift the generated UH in time or reduce the peak flow and total volumes. A series of "training" thunderstorms that all passed over the same region have dumped 4 - 5 inches of rain over a wide swath of Northern Minnesota overnight and early this morning. Nearly 8 inches of rain fell in the Denfeld area of western Duluth. This is more rain than fell in the city's previous worst flood on record, which occurred August 20, 1972. Major flooding is occurring, and only emergency travel is recommended in the city due to flooded roads. system and the saturated ground cannot take much more rain. According to wunderground's weather historian, Christopher C. Burt, the all-time 24 hour precipitation record for Duluth is 5.79" on 8/22 - 8/23 1978; 4.14" was recordedon Tuesday at the airport. If you have a time series of flow and water quality at a node in SWMM 5 you have the option of using either a Mass loading or a concentration loading (Figure 1). If you have a concentration then the load to the node internally in SWMM 5 is the flow times the concentration. Alternatively, if you have Mass loading then the program will calculate the concentration from the flow and the load. The table below shows some combinations of flow in cfs and load in pounds per day to yield various BOD 5 concentrations it the network nodes and links (Figure 2). For example, at a flow of 10 cfs you can get a BOD5 concentration of 100 mg/l with a loading of about 5400 pounds of BOD5 per day (Figure 3). Figure 1. If you use a time series load in SWMM 5 you need TWO time series, one for the flow and one for the mass load or concentration. Figure 2. The Mass loading needed to generate a concentration at a particular flow rate.